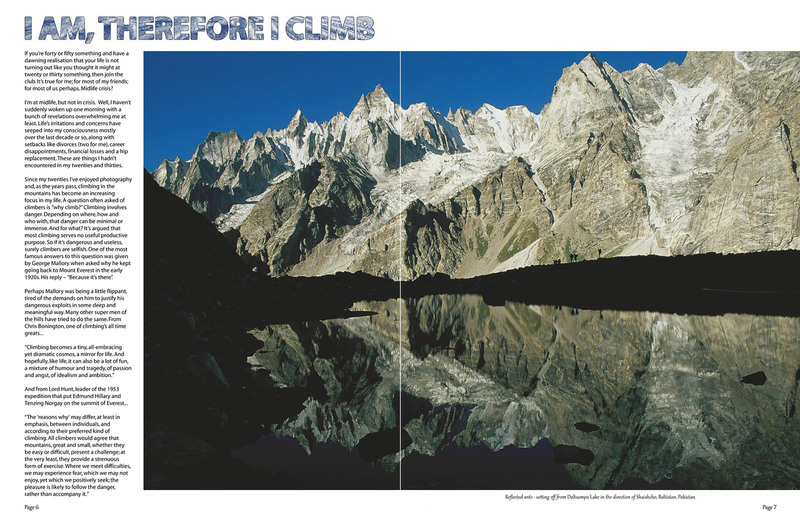 A large format book using both words and pictures to explore, in parallel, climbing in the mountains and the collective reflections of a typical fifty year old grappling with life’s issues. 156 pages, 316mm high by 242mm wide. 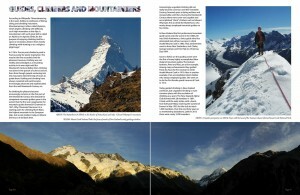 Approx 20,000 word narrative, plus over 300 colour photos with captions, many spanning two pages as panoramas. 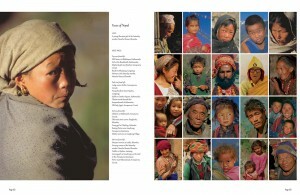 The photography is sensational and your words to go along with it all were both very personal and very touching. There were a number of places I simply handed your book to my wife and said “here read this – it helps explain why”. And she did understand! Well written and beautifully photographed, the enthralling images and entertaining text provide a window both into a man’s soul and the magnificence of nature and humanity. A great read, entertaining and inspiring. 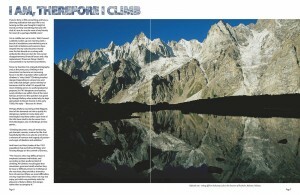 Occasional Climber is a beautiful book to look at, with outstanding photos of some magnificent places. But it is also a book that reminded me of the important things in life – connections with family, nature and indeed humanity. I am not a mountain climber. However Occasional Climber kept me totally immersed! There was so much feeling and a great spirituality about it. And the photography is astounding! 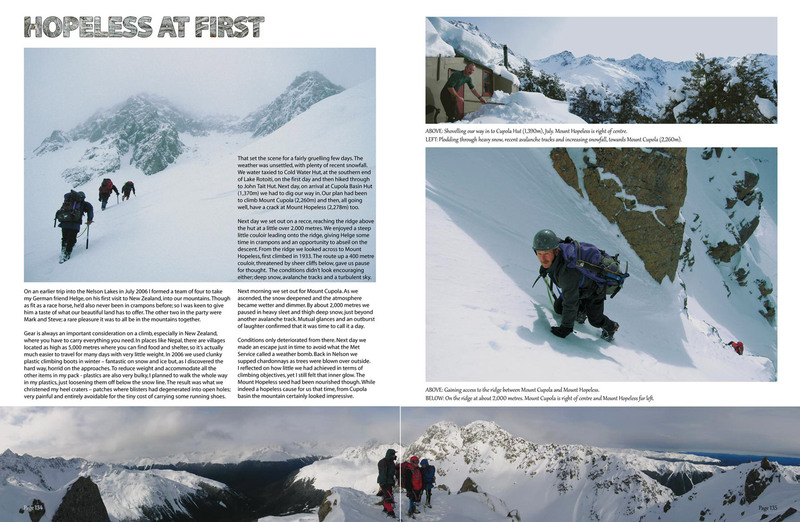 An authentic outlook on life is a welcome change from the commercial pap or negative mountaineering drama out there. Occasional Climber exceeded my expectations and I think it could be a real hit with the right exposure. Not a book I would normally pick up at the local bookshop, as I’m not really an outdoorsy person and most certainly not a climber, yet I enjoyed the read. I especially enjoyed reading about the bonds you have with your children and the closeness that obviously came from their experiences of your climbing adventures. I imagine most parents don’t find such special time in such special places as you appear to. It was an easy read and, being interspersed as it was with so many terrific photos, made it especially effective. What an incredibly insightful and thoughtful account of your various ‘journeys’. It certainly gives me pause for thought – you set an excellent example! A great book. Evoked many memories of times past when I traipsed the hills and mountains throughout New Zealand. I really enjoyed the mix of climbing pictures, climbing stories and personal stories. It made the book kind of intimate and easier to relate to. Occasional Climber is a damned fine book. Very well written, very well photographed, altogether a well-wrapped package of beauty and home-spun wisdom. Great book. Thanks for taking the time to send it over and thanks for writing it in the first place. 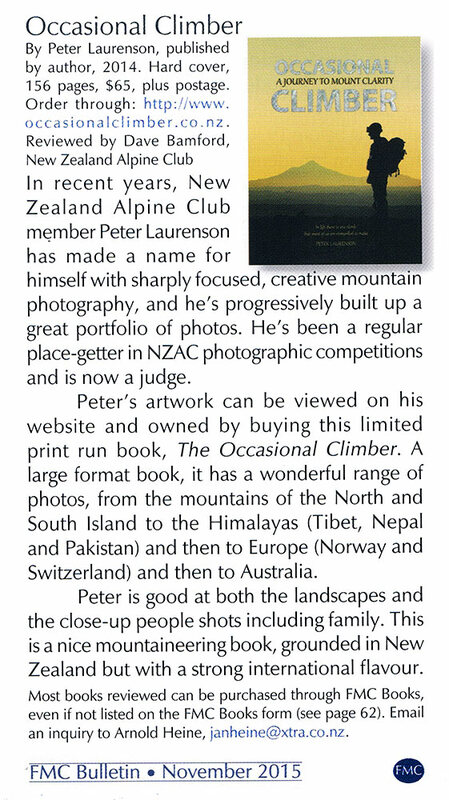 The photos are excellent and it reads well – many ‘climbing’ books don’t. 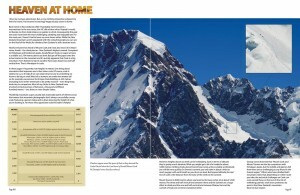 My book is in a generously sized coffee table format, richly filled with alpine images. But it also offers a narrative that weaves the images together in a way that you might not expect in what, at first glance, appears to be just a mountain photography book. 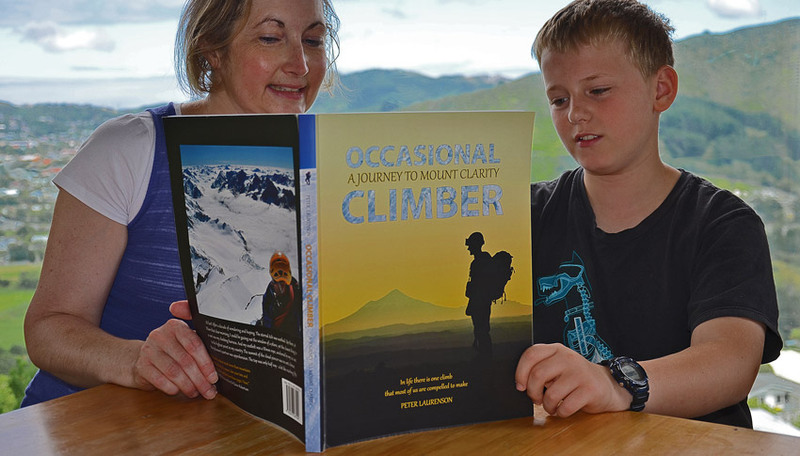 Occasional Climber works on two levels – firstly it takes the reader into mountain places, both in New Zealand and further afield, giving the reader an up close perspective. Quite a few of the “known” NZ peaks are covered so it’s of interest to hikers who are thinking about getting above the trails; and climbers who enjoy reliving climbs. I’ve been into the Himalaya often, so that aspect is also covered at an accessible level – both terrain and people. 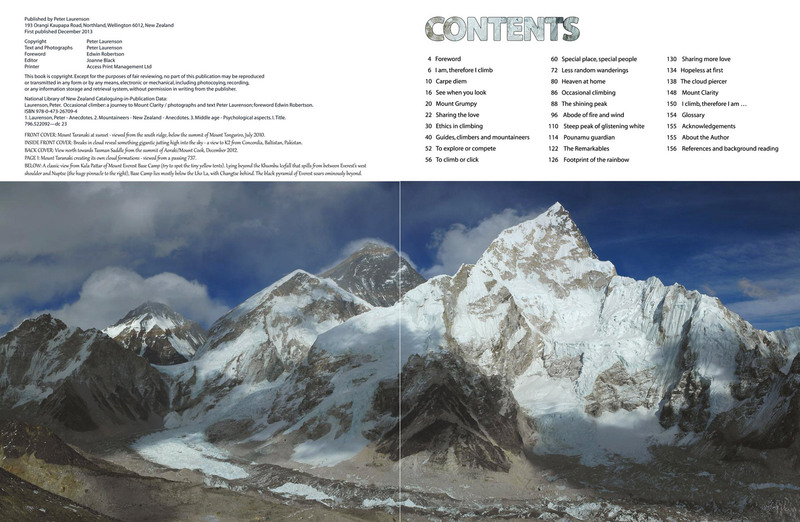 On the second level I’ve used my mountain experiences to reflect on wider issues – some mountaineering related, but just as many of a broader nature, ultimately taking a look at fundamental issues such as the role of religions, getting older, reaching fifty, even the purpose of life. This might sound like quite a hotchpotch, but those who’ve read my book enjoy the way the whole comes together.